Grand Theft Auto III is the third installment of the Grand Theft Auto series, (not including the London expansions) and was released in late 2001 for PlayStation 2 in North America, Europe, and Australia. Over the next three years, an Xbox and a PC version were released, and Japan saw releases of all three platforms as well. GTA III is the first foray into true three dimensional GTA gameplay, with the player taking control of the game via a third person perspective, viewed from behind and above the player character, as opposed to a top down perspective. The transition from top town to full 3D has been widely regarded as a great maneuver, proven by its phenomenal sales figures. The changes made for GTA III marked a defining point in the series' graphical representation and control scheme. More recent GTA titles have stuck with the same 3D control and visual scheme, and all future titles of GTA are likely to remain so, albeit improved in visual quality as hardware improves. You've been betrayed and left for dead. Now you're taking revenge, unless the city gets you first. Mob bosses need favors, crooked cops need help and street gangs want you dead. You'll have to rob, steal and kill just to stay out of serious trouble. Anything can happen out here. 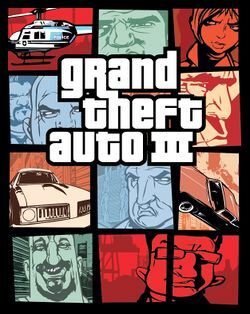 In some PAL territories, Grand Theft Auto III was released with different cover artwork, despite there being no major differences in the game itself. Below are two examples, of the box art used for the UK and German versions respectively. This page was last modified on 20 April 2012, at 14:15.